Smoke rises Thursday, Aug. 2, 2018 from an underground fire at the former 'stump dump' site on Trafalgar Road in Bella Vista. 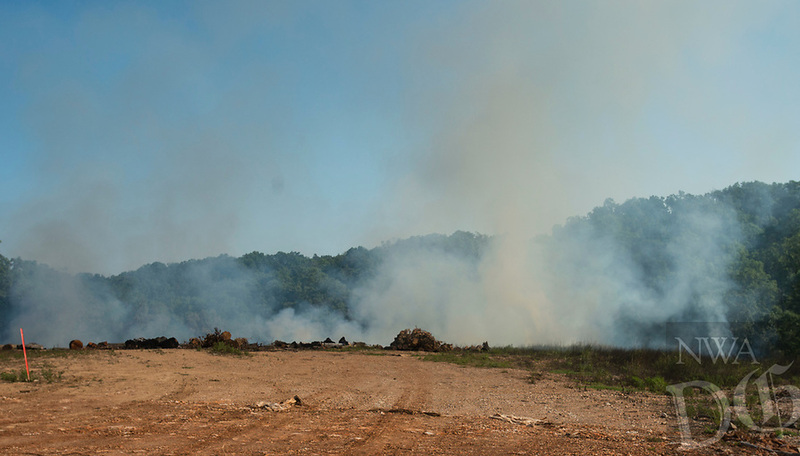 The fire began some time last weekend when the property owner was burning above-ground brush piles, according to Cassi Lapp, communications manager for the city of Bella Vista. The site was once a Bella Vista Property Owners Association 'stump dump' where residents of the city could dump yard waste, said Lapp. The dump, which is 40-60 feet deep, has been closed and covered over for some time and is now privately owned, said Lapp. The Bella Vista Fire Department posted on their facebook page Wednesday saying they were monitoring the fire but there is 'no safe way at this time for us to put out the fire.' Lapps said the fire department estimates the fire could burn underground for months.